A Traditional Life Lived: Media loves Swastikas and Nazi's as long as your pro-illegal immigration. Media loves Swastikas and Nazi's as long as your pro-illegal immigration. On Saturday, pro-illegal immigration supporters in Phoenix, Arizona, carried signs quite similar to what our press found repulsive and extreme when present at conservative protests. 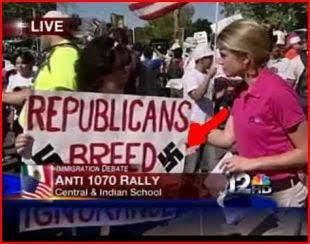 Will swastikas and the Arizona governor being referred to as "Adolf Brewer" be equally unacceptable to America's media? Go read the whole article at News Busters.